Stirling Properties commercial real estate company is pre-leasing Offices at Spanish Fort Town Center, a proposed Class-A office building to be located within the Spanish Fort Town Center mixed-use development in Spanish Fort, Alabama. The offices will be situated along Bass Pro Drive on the east side of the center. 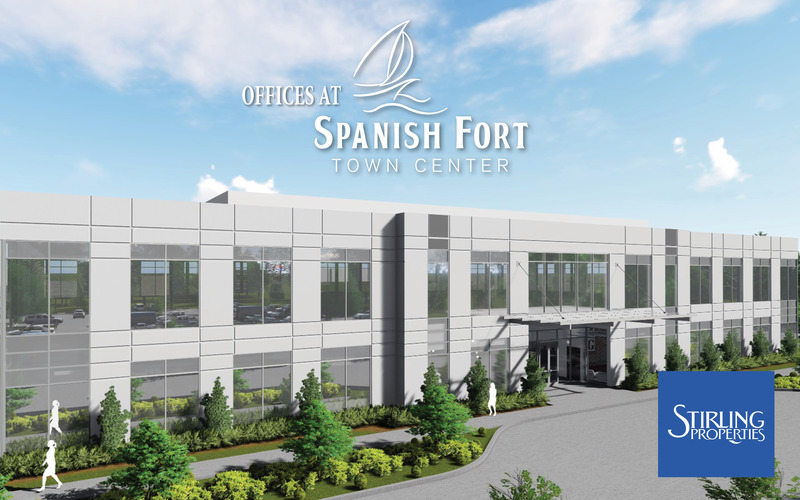 The proposed Offices at Spanish Fort Town Center includes the construction of a 2-story office building consisting of roughly 44,000 square feet. The building will feature state-of-the-art construction, efficient floor configurations, and ample surface parking. Adjacent land is available for additional office development phases to meet expansion requirements and demand. 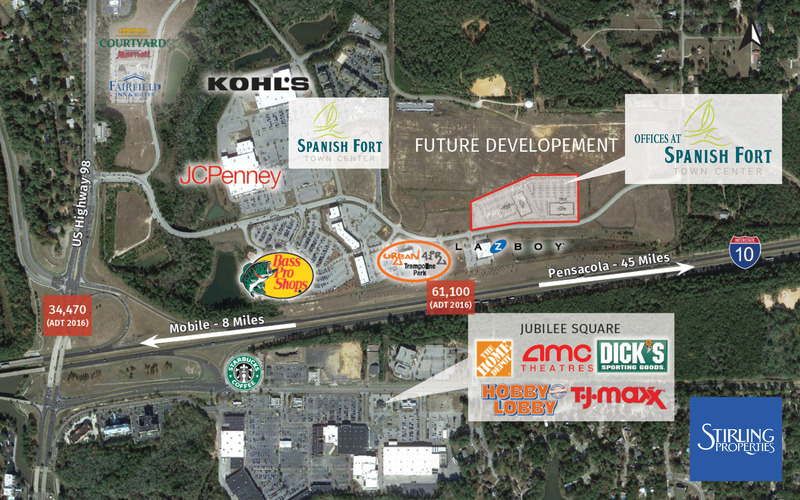 Stirling Properties currently handles leasing for Spanish Fort Town Center. The proposed office development would be owned and managed by the company. Since opening its Mobile office in 2014, Stirling Properties remains committed to expanding its footprint in South Alabama and the surrounding region. “The Offices at Spanish Fort Town Center will be a great addition to the area. It will be located within walking distance of abundant amenities that already exist as part of the overall Spanish Fort Town Center mixed-use development. This is a great example of the live, work, play development model that is becoming attractive to many companies and employees,” said Jeff Barnes, CCIM, Broker with Stirling Properties. Spanish Fort Town Center, anchored by Bass Pro Shops, Kohl’s, JCPenney, Urban Air, Fairfield Inn, and Courtyard by Marriot, is a 230-acre premier master-planned development located at the intersection of Interstate 10 and U.S. Highway 98 in Baldwin County. The center includes 450,000 square feet of retail and restaurant space, an apartment community, hotels, banks, and entertainment options. Stirling Properties has a diverse portfolio of retail, office, mixed-use, healthcare, and hospitality developments and managed properties across the Gulf South region. The company recently developed a similar office product—Offices at River Chase—in the River Chase mixed-use center located in Covington, Louisiana. For Offices at Spanish Fort Town Center leasing information, contact Jeff Barnes, CCIM, at (251) 375-2496 / jbarnes@stirlingprop.com or Angie McArthur at (251) 375-2481 / amcarthur@stirlingprop.com. Stirling Properties is located at One St. Louis Centre, 1 St. Louis Street, Suite 4100 in Mobile, Alabama.